Welcome to Breezy Knoll Cottage! Come with family or a few friends to stay at our attractive cottage nestled the woods at the end of a private road. You'll love waking up and walking or biking to nearby Warren Dunes State Park. Spend some time at Captain Mike's Fun Park with the kids, or go shopping in one of the unique local antique shops. There are amazing u-pick farms to visit nearby if you wish to sample local blueberries, peaches, apples, and more. It is not unusual to see a mother deer with her baby walking across the front lawn early in the morning. There are also countless squirrels, rabbits, and birds. We have even seen dozens of wild turkeys strolling across the property in a big group. You can end your days by roasting marshmallows and hot dogs over the fire pit or watching the sunset at the beach. You'll be glad you chose to stay with us! Please contact me for additional information. Smart TV. You can stream directly from your Netflix, Amazon, Hulu accounts, and more. We stayed here for our hunting camp. The house worked great for the three of us! It was comfy, clean and cute! The washer and dryer came in very handy. Great location close to the dunes park! Efficient place, plenty of parking, very good entertainment choices and tv set up. Good for a dog or two being in the woods nice grounds to roam. Close access to the freeway for easy travels. Great area for hiking and beach walking, good local restaurants, not so good for biking no paths. This house was perfect for our family! It was clean when we arrived and perfect for what we needed. It was super close to Warren Dunes State Park and close to other small towns nearby as well. Love the large yard for both our son and dog to run around. It was super easy to connect to the WiFi and stream TV for our son as well. We would definitely stay here again if we come to the area! 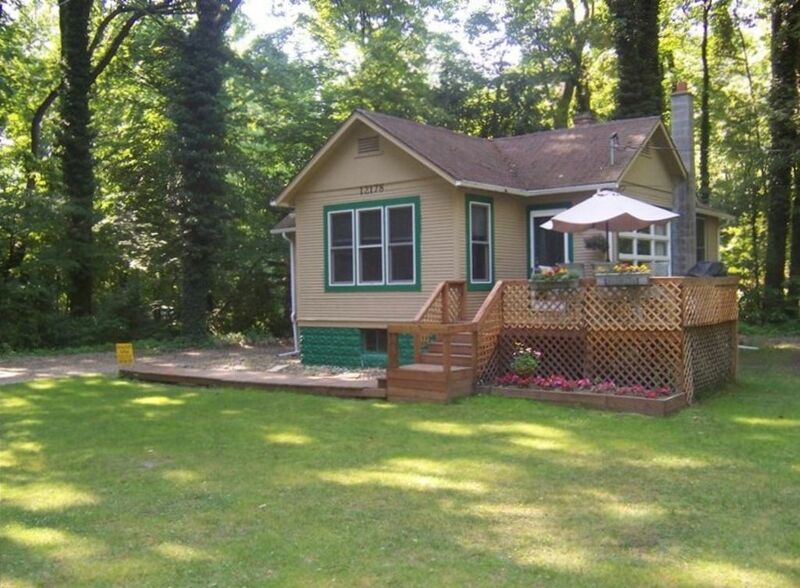 Quiet, Cozy Cottage in GREAT location! The cottage was just as listed! It was clean, cozy, and included all the listed amenities. The location was perfect for both the beach, wineries, breweries, and other neighboring towns to explore. This was our first time in Sawyer and we loved every minute of it! We can't wait to come back! Will never sign up for something or anything sight unseen again. Had to clean floors and did not use cabinets or drawers due to cleanliness. Over the years, I've learned you cannot please everyone, and this is certainly one of those cases. I was in contact with this couple on and off, over the last two years arranging this stay. I make a conscious effort to not overstate what this property is. It is a cute little old house, tucked in the woods. Perhaps this couple was expecting something higher end? During the first week of their stay, my husband and I went to the house to help with various things such as working the mini blinds and hooking their personal computer up to the wifi, because they did not know how to do it. The last time my husband went over to help with something, Lora (her name is Lora, not Mora) actually hugged my husband, and apologized for being "such a pain." Maybe you can see why I was so baffled when we received this review. We were always happy (and quick) to come over and address their many concerns and requests. If they were not satisfied with the condition of the property, the decent thing to do would have been to contact us to clean further, or request a partial refund. We would have been happy to work with them. Instead it seems they wanted to attempt to hurt our business. To say we were bind sided, is an understatement. About the cleanliness of the house, I do not doubt a stray grain of sand or two may have been lurking in the corners of the laminate floors. Sand is my nemesis! However, I"m honestly confused about the comment about the cabinets and drawers be too dirty to use.